Set for slide/lap steel use), Brass Frets, White Pearl Fret Markers, Hot Piezo pickup Direct Wired to a 1/4 inch Output Jack, Awesome Sound and More! Black Pearl Fret Markers, Nickel Strap Buttons, Hot Piezo Pickup Direct Wired to a 1/4 inch Output Jack, Awesome Tone and More! 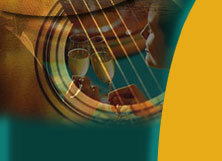 This guitar has a very light action and is set up for hand playing, not slide. 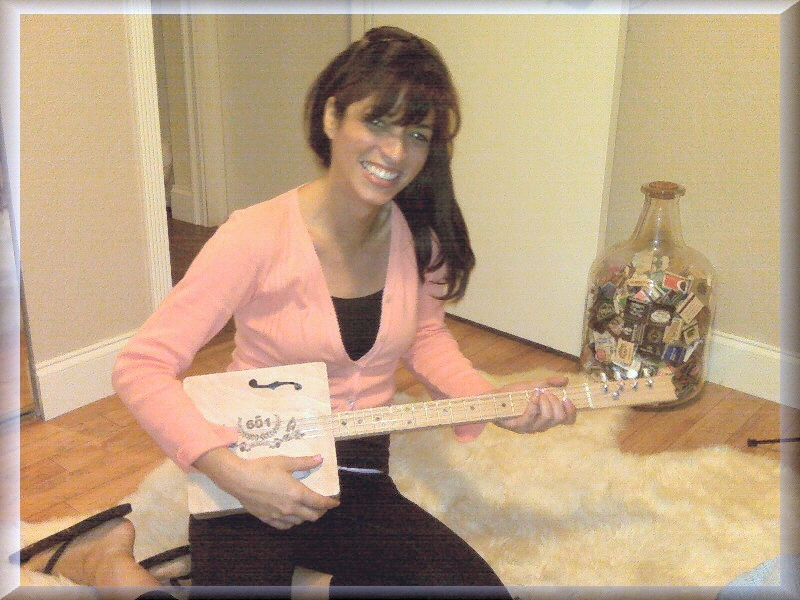 This guitar is also signed by Erik Espinosa, owner of the 601 brand! Awesome Tone and More! 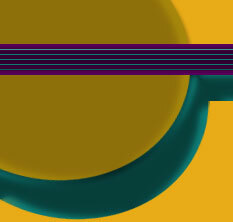 This guitar has a dual action and is set up for playing slide or finger. Direct Wired to a Recessed Chrome 1/4" Output Jack, Awesome Tone and More! 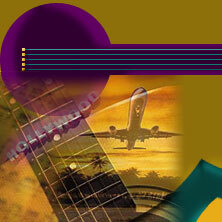 This guitar has a dual action and is set up for playing slide or finger. Awesome Volume, Louder than most mini Amps, Awesome Tone and More! Wired to a Recessed Chrome 1/4" Output Jack, Awesome Tone and More! 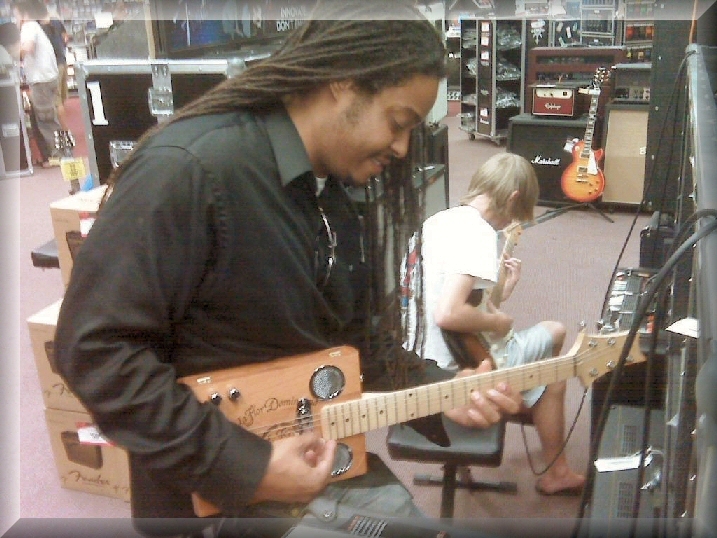 This guitar has a nice medium action and is set up for playing finger. 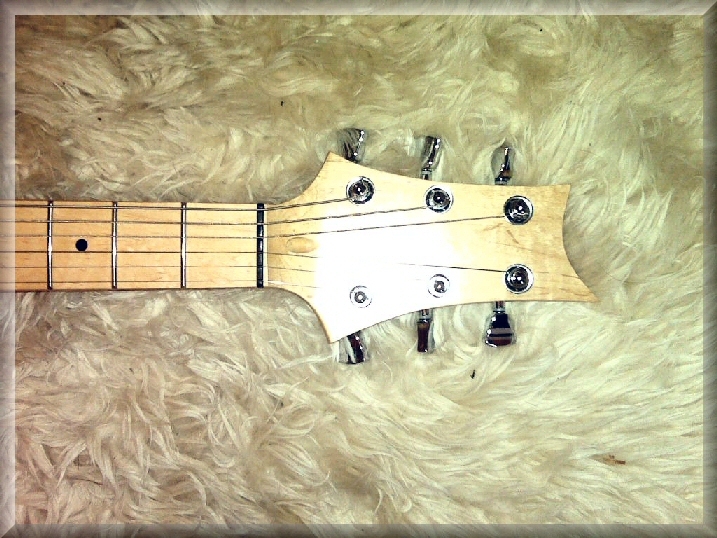 Gold Neck Plate, Gold Floyd Rose Nut, Gold Wilkinson Tuners, Jackson style headstock with Mojo Hand Logo. A 6 string Acoustic-Electric Padron 1926 Series Cigar Box (8" X 11" X 2") with a Maple Neck and Maple Fretboard, Ebony Fret Markers, Jackson Style Headstock with matching Cedar Veneer and Mojo Hand Logo, Black Truss Rod Cover, Gold Wilkinson tuners, Gold Floyd Rose Locking Nut, Gold Dobro Sound Holes, Gold Les Paul Jr. Bridge, Gold GFS Humbucker Pickup, Gold Volume and Tone knobs, Gold Strap Buttons with built in 1/4" output jack, and Bimini Cricket logo on the neck. Man, does she sound sweet! A 6 string Acoustic-Electric Padron 1926 Series Cigar Box (8" X 11" X 2") with 6 coats of clear lacquer, a Maple Neck and Rosewood Fretboard with Ivory Binding, White Pearl Fret Markers, Jackson Style Headstock with matching Cedar Veneer and Mojo Hand Logo, Black Truss Rod Cover, Gold Neck Plate, Gold Gotoh tuners, Gold Floyd Rose Locking Nut, Gold Dobro Sound Holes, Gold Adjustable Bridge, Gold Wilkinson Humbucker Pickup, Gold Dual Volume and Tone knob, Gold Ibanez Strap Buttons, Gold recessed 1/4" output jack, Man, does she sound sweet! 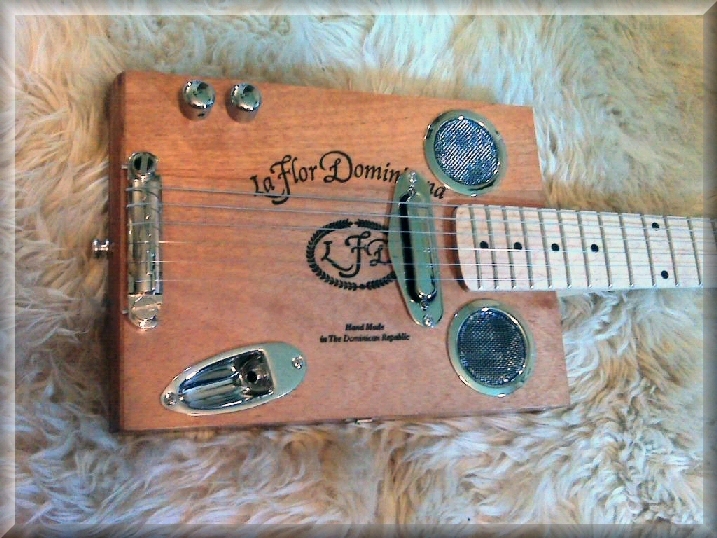 A 6 string Acoustic-Electric Don Pepin Garcia Series Cigar Box (8" X 11" X 2") with a Maple Neck and Rosewood Fretboard, Pearl Fret Markers, Jackson Style Headstock with Mojo Hand Logo, Black Truss Rod Cover, Chrome Keystone tuners, Chrome Floyd Rose Locking Nut, Chrome 1" Sound Holes, Chrome American Style Bridge, Pearl Single Coil Pickup, Chrome Volume and Tone knobs, Chrome Strap Buttons with built in 1/4" output jack. Man, does she sound sweet! Features a six stringed Hoyo de Monterrey High Gloss Black Box (7 1/2 X 12 X 2 1/2), a Maple Neck (25.5 inch scale) with a Maple Fretboard, Black Shark Fin Fret Markers, Jackson Style Headstock with Mojo Hand Logo, Black Truss Rod Cover, Black Custom High Quality Tuners, Black Floyd Rose Locking Nut, Black Les Paul Jr. Style Bridge, Black Single Coil Hot Pickup, Black 2-in-1 Volume and Tone Controls, Black Strap Buttons, 1/4" Output Jack, light action. Man, does she sound sweet! 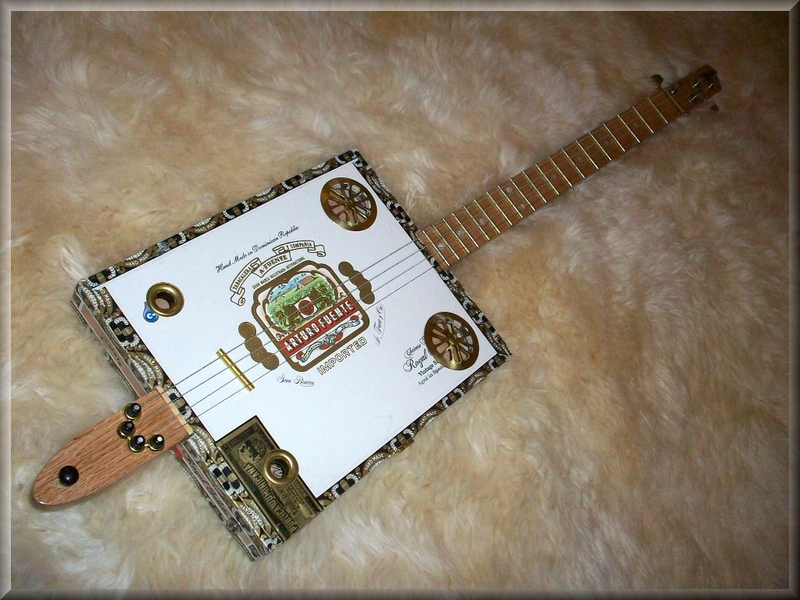 Cohiba cigar box guitar. 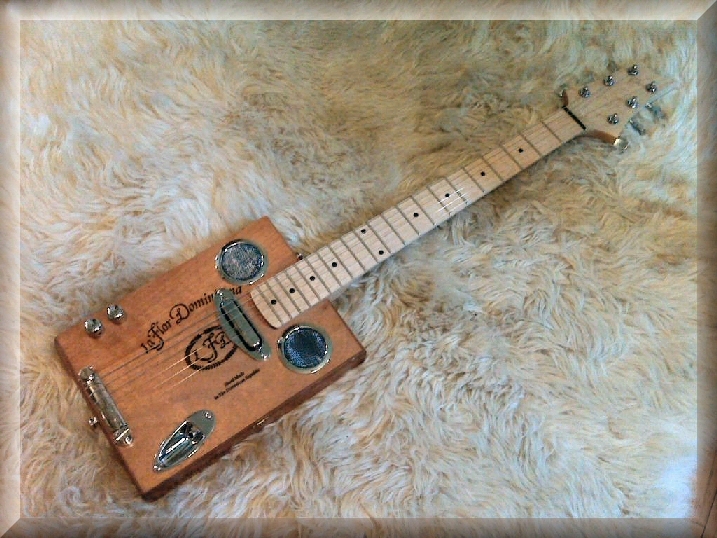 A six string cigar box guitar with 25.5 inch Scale, Gold Tuning Machines with Ebony Knobs, Acoustic Style Headstock, Recessed Gold Jack plate, Gold Dobro Style Sound Holes, Gold Stratocaster Style Bridge, Gold Single Coil Neck Pickup, Gold Strap Buttons, Gold two-in-one Volume/Tone Control, Man, does she sound sweet! 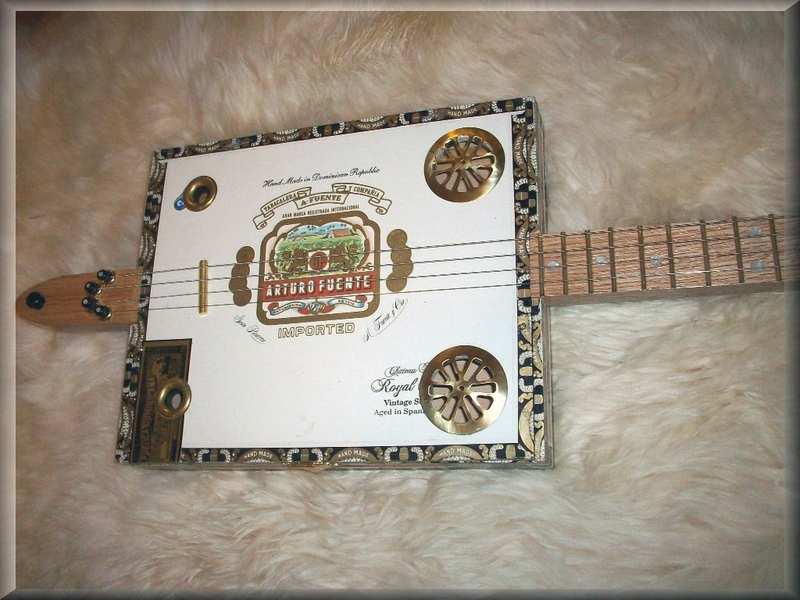 Jose Garcia 601 Custom cigar box guitar. 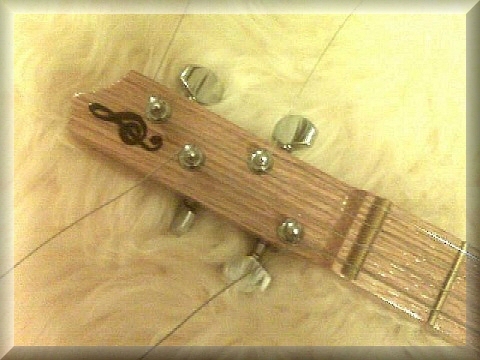 A four string left-handed guitar, 8 ½ X 9 X 2 Inch Box, Serial No. 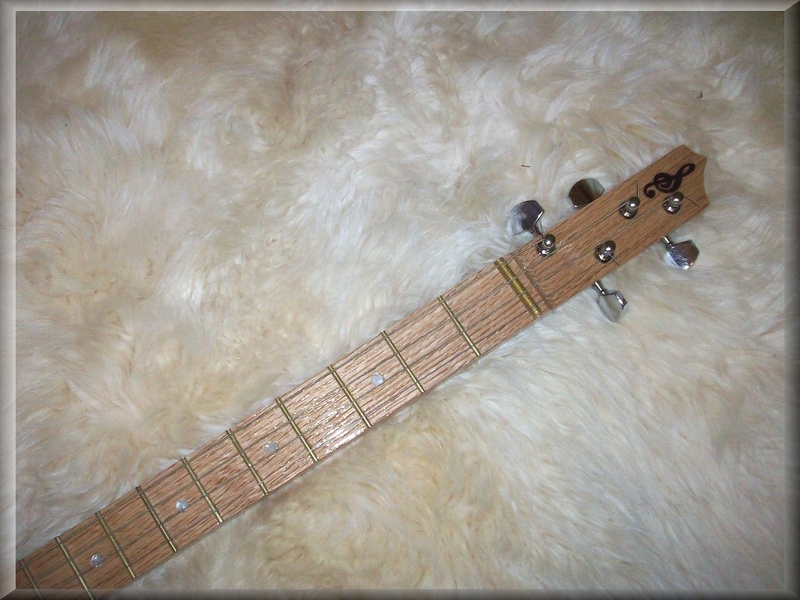 11-02, with a 25 inch Scale, Maple Neck with a Tung Oil Finish, Mandolin 'A' Type Tuning Machines with White Knobs, Acoustic Style Headstock with a 6 degree scarfed angle, Cedar Veneer on Headstock Face, 1/4 Inch Output Jack, Abalone Fret Dots, Tan Corian Polished Bridge, Bone Nut, Medium Nickel Frets, Thru-Body Polished Steel String Ferrules, Hot Piezo Neck Pickup, Nickel Strap Buttons, Man, does she sound sweet!